BASSETERRE, St. Kitts – The construction of a modern East Line Bus Terminal on Wellington Road is expected to begin within a few months. The East Bus Line will be constructed at the current site of the Public Works Department. The government has recently entered into a contract of over 200, 000 dollars to start the demolition works at the old St. Kitts Sugar Manufacturing Corporation (SSMC) repair shop, which will be the site for the relocation of the existing vehicle maintenance division of Public Works and that the relocation will be completed in the next couple of months. Meanwhile PASSENGERS travelling to Nevis will be inconvenienced to some degree for at least another three weeks as the Government, through the St. Christopher Sea and Airports Authority (SCASPA), continues to renovate the Basseterre Ferry Terminal. Renovation works, which started over a week ago, would be for passengers’ comfort when completed, according to Public Infrastructure Minister, the Hon. Ian Liburd. Commenting on the project, the Minister told local media that thousands of passengers travel between St. Kitts and Nevis on a daily basis and the authorities saw it prudent to make the area “more passenger friendly”. The terminal has been known as an area where vagrants rest, and many of them have been seen urinating and sleeping at the facility; all of which usually occur while passengers, both locals and visitors to the island, are waiting to board Nevis-bound vessels. Liburd indicated that the cost for renovating the facility is over $100,000. Over the past year or so, the Ministries of Tourism and Public Infrastructure had sought to renovate the Ferry Terminal with the aim of lifting its standard as a major facility for commuters. Liburd’s Ministry recently upgraded the washroom facilities, while work is expected to be done to enhance the bars and shops in the area. 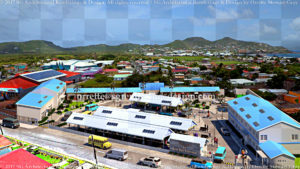 The East Bus Terminal in addition to the West Basseterre Bus and Ferry Terminal upgrade are part of the Team UNITY government’s strategy to uplift the public transport service in St. Kitts.